In Masters Gallery, the players are art critics and gallery owners. All have their own favorite artist in this pantheon of greats-or at least they do until the game begins. Tastes and opinions about each artist's value change constantly in the world of Old Masters art. No one has more influence on those values than the players in this game. Which player will exert the most influence? Who will best anticipate these changing tastes and opinions, and thus assemble the highest-valued collection of these masterpieces? The cards in this game feature 30 of the most beautiful pieces of art ever created by Van Gogh, Renoir, Monet, Degas and Vermeer. Over the course of four rounds, players use these cards to establish the relative value of each artist's body of work. Unique mechanics and ingenious design make the gameplay unpredictable and even more fun every time you play. 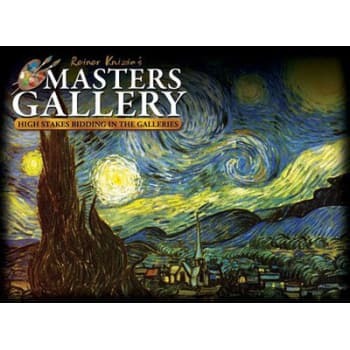 Revel in the beauty of Old Masters art, while enjoying the intriguing game of Masters Gallery.